The busiest week of the year continued on Tuesday at UN Headquarters and we used our social media platforms to report on the events. Below are some highlights. Social media post from around the world were displayed in UN Headquarters for world leaders, CEOs and activists to see. See more behind the scenes photos in our Flickr gallery. Many of the more than 120 Heads of States and Government, business, finance and civil society representatives were at the Climate Summit to announce commitments that will reduce emissions, enhance resistance to climate change and mobilize financing for climate action. This video, narrated by Morgan Freeman and featured teen activist from around the world, opened the Summit. Kathy Jetnil-Kijiner, Civil Society Representative from the Marshall Islands, with members of her family (on stage at right), moved attendees to tears at Summit opening. You can watch her recite her poem and hear her remarks online. See more behind the scenes photos like this one, including updates from our “Social Media Zone” in our Flickr gallery. Find out what Secretary-General Ban Ki-moon discussed in his bilateral meetings with world leaders in this listing of readouts posted by the Office of the Spokesperson for the Secretary-General and see photos of the meetings here. 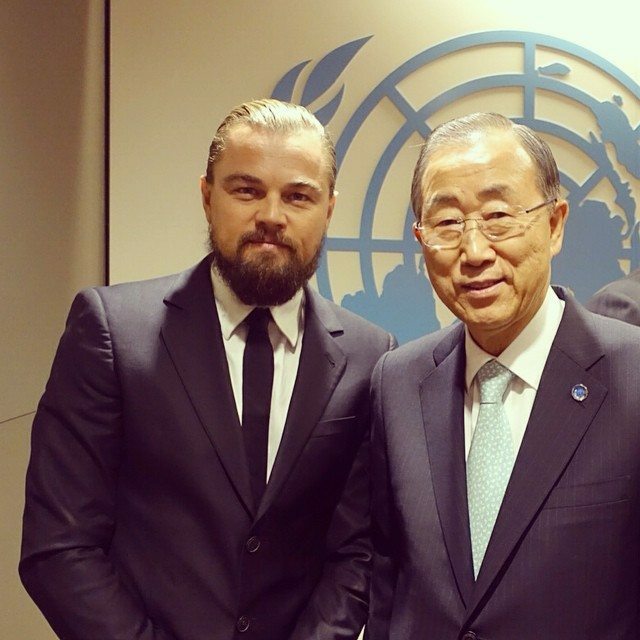 The UN looks back at its Oscar win!